The ambassadors of so-called tennis heavy metal, Brother Firetribe, have reached the honorable age of 15 as a group. 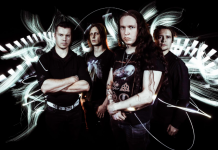 While the band just released their acclaimed fourth album, Sunbound, since their inception the band has been forced to operate within the schedule of their guitarist, Emppu Vuorinen – he has been busy conquering the world with his other better-known band, Nightwish, for at least as long. 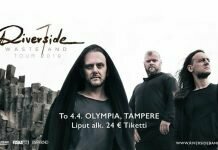 Currently, Nightwish is having a year off, so Brother Firetribe decided to make use of the time by touring Finland with a total of eleven shows. The tour was justifiably concluded in Helsinki’s Tavastia on May 5th, so it was evident that the place was going to be packed with people and grin-inducing rock tunes. As the show’s opening act, Brother Firetribe had selected The Nights, a band (so far) completely unknown to the larger audience. The mere 2-year-old joint project of successful musicians Sami Hyde and Ilkka Wirtanen (Hyde has sung in the band of TNT-vocalist, Tony Mills; Wirtanen is the court producer of Reckless Love) has released one track off their self-titled debut album, set to be released in the end of summer. I doubt that the band has played more than a few gigs so far, but as the clock struck 21:00, a lot people had already showed up, with some of them clearly being fans of the band, knowing most of the songs. From the opening song “Welcome to the Show” onward, it was pretty obvious that these guys were seasoned professionals, as Hyde’s and Wirtanen’s performances were laid-back, and bassist Harri Kokkonen and drummer Jan-Erik Iivari supposedly weren’t greenhorns either. Regarding The Nights’ material, one cannot say that the guys have tried to reinvent the wheel, but it’s amazing how composing insanely catchy songs using only those four basic chords in a different order is still possible. The songs contained a great amount of variance, as there were both cheesy ballads and almost heavy metal-ish riffs between the more ‘usual’ energetic AOR tracks. If the Swedish Work of Art is to your liking, but a heavier output is not a problem, I’d suggest you dig into this band right now. As a whole, the show was excellent – The Nights had the element of surprise on their side, and they sure used it. My money’s on wider success! After The Nights, an unusually long intermission ensued, as Brother Firetribe’s showtime was marked at 22:30. Tavastia started to fill up at a constant rate, and once the familiar tennis match intro track started playing, the venue appeared full. The show started off as expected with Sunbound’s titular intro and “Help is on the Way”, and the party was on. The band played “Indelible Heroes” before Pekka Heino greeted the audience for the first time and bemoaned the band’s old age. Afterwards, it was natural to play “One Single Breath”, since it’s reputedly Brother Firetribe’s first composed song. I hate to say this out loud, but Brother Firetribe’s show was a bit two-fold. The band had additional spotlights on stage, making the show visually very appealing, and every player handled their parts as well as one would have learned to expect over these years. Surprisingly, the weakest link of the evening was Heino himself: the man’s focus seemed a bit off at times, and in addition he seemed to forget his lines (or he just didn’t sing them) on more occasions than would have been possible to just write off as rock show antics. Was it fatigue? Had he caught a cold? Hard to say, as during his interim speeches, Heino was himself and also clearly moved by the audience’s constant cheering. Sunbound dominated the setlist, as a total of eight out of fifteen songs were from the new album. Considering the tour has been advertised as a 15-year anniversary tour, the choice was, in a way, surprising, but then again, Sunbound might be Firetribe’s greatest output on the whole. Diamond in the Firepit, released 3 years ago, was featured with only the video single ”For Better or For Worse”, and the only song, besides ”One Single Breath”, from the debut album False Metal was ”I’m On Fire.” The main set was concluded with ”Heart Full of Fire”, before Heino invited Jonna Geagea on stage to do a duet with him – I doubt we’ll see Anette Olzon performing the song anymore, for obvious reasons. My personal highlight on the set was the first encore, ”Phantasmagoria” – had Brother Firetribe been around in the 80’s, the band would have been enjoying worldwide success upon the song’s release. As always, the final song for the evening was ”I Am Rock”, still managing to entertain after all these years. The band bowed to the audience, receiving a thunderous applause. An excellent show! The merch table seemed to attract a lot of people afterwards, as the selection featured a few older T-shirt designs in addition to the Sunbound-themed stuff. The coatroom service worked swiftly, as always in Tavastia, but I’ll have to point out the bar prices had once again gone up – it’s understandable to capitalize on the venue’s reputation, but 6,80€ for a small pint is starting to get ridiculous. Regardless, despite the small hiccups here and there, Brother Firetribe was once again solid as steel (or rock), and hardly anyone left Tavastia disappointed. I’ll see you guys at Tuska!